Euro is still consolidating. The targets for the bulls are still at the levels of 50% and 61.8% (fibo-extension), which are confirmed by several more fibo-levels. I have two short-term buy orders. The pair is expected to break the local maximum. 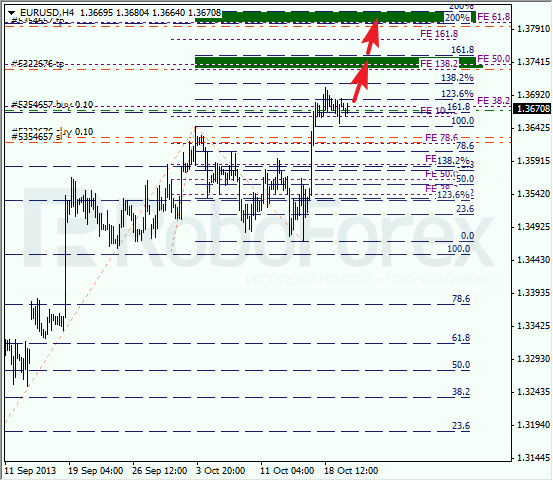 At the H1 chart, the pair is getting closer to one of the temporary fibo-zones, where the current correction may stop. Later the price is expected to reach the level of 50% inside the next temporary fibo-zone. Franc is also consolidating. I have only one sell order so far. Most likely, one of these days the bears will break the minimum during the next several days. The main target for them is still at the level of 61.8%. At the H1 chart, the situation hasn’t changed much over the last 24 hours. According to the analysis of the temporary fibo-zones, the lower target levels may be reached by the middle of Wednesday.